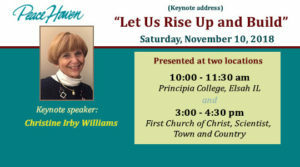 On Saturday November 10th there are two wonderful lectures you will not want to miss! 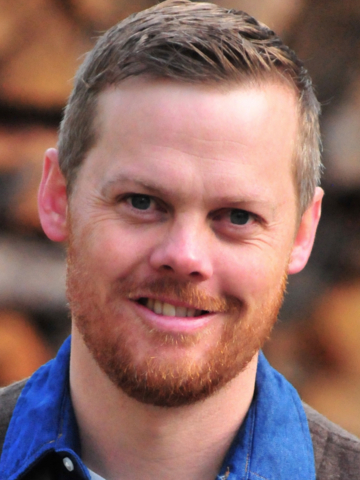 If you would like to view more details of Josh Niles’ lecture, please click here. If you cannot make this lecture in person, you can call in at 314-627-1157 with the code 197369. Christine “Chris” Williams’ consecrated service to the Christian Science movement includes her work over many years in the field of Christian Science nursing through education and management. She has written for the Christian Science periodicals and served in almost every capacity as a branch church member. Currently, Chris serves as Chairman of the Tenacre Board of Trustees; she is also a member of the Principle Foundation’s Board of Directors. Chris has given numerous inspirational talks, taught Bible classes, addressed Christian Science Associations, and facilitated workshops on a variety of subjects for Christian Science nursing organizations, camps, schools, and branch churches. Peace Haven’s Trustees and staff are delighted to welcome her as the Keynote Speaker for our 2018 Annual Meeting. If you would like to view more details of Christine Irby Williams’ lecture/s, please click here. This entry was posted on Thursday, November 1st, 2018	and is filed under Ideas, Lectures, Members Activities.